AUSTIN, Texas--(BUSINESS WIRE)--NI (Nasdaq: NATI), the provider of platform-based systems that enable engineers and scientists to solve the world’s greatest engineering challenges, announced today that major automotive manufacturers like Subaru are using NI hardware-in-the-loop (HIL) technology to simulate actual road conditions for electric vehicle testing, eliminating environmental factors to reduce test time and costs. Traditionally, engineers have conducted vehicle tests using finished cars on test courses or public roads to check the vehicle’s performance and safety response. However, certain limitations, such as weather and fluctuating road surface conditions, can make it difficult to conduct reproducible tests on roads in a timely manner. Moreover, electric vehicles are extremely complex due to their many subsystems, which are all interdependent on each other. This complexity makes the job challenging for automotive test engineers with short development cycles and pressure to limit costs. To combat these issues, Subaru replaced the roads in the validation tests with a NI HIL simulation solution built on NI PXI products and LabVIEW software. With the HIL system, Subaru can eliminate environmental factors and thoroughly and efficiently test a vehicle’s embedded controller in a virtual environment before running real-world diagnostics on the complete system. 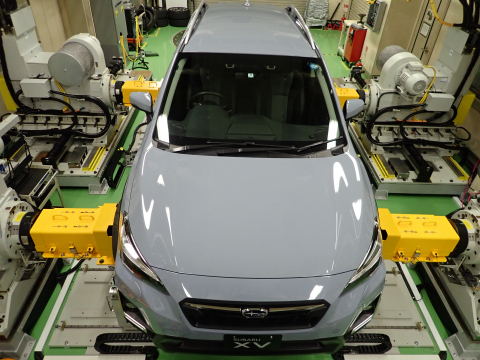 Subaru further outfitted its vehicle test solution with a controller-driven dynamometer by HORIBA and CarSim vehicle dynamics simulation software deployed by Virtual Mechanics. Together, they produce load conditions equivalent to those generated on actual roads. This driving system transmits the calculated values to the NI HIL system in real time to create closed-loop control between the models on the HIL system and the driving system. As a result, the HIL interaction system can apply the appropriate load to the vehicle throughout the tests. Subaru plans to use this test system at the final stages of development for electric vehicles as a final quality check, and eventually expand its use for all car types. By adopting this system, Subaru anticipates reducing labor hours by half compared to conventional methods. For more information about how NI develops HIL systems for vehicle simulation and testing, visit ni.com/en-us/innovations/automotive/hardware-in-the-loop.html. NI (ni.com) empowers engineers and scientists with a software-centric platform that incorporates modular hardware and an expansive ecosystem. This proven approach puts users firmly in control of defining what they need to accelerate their system design within test, measurement and control. NI’s solution helps build high-performance systems that exceed requirements, quickly adapt to change and ultimately improve the world.